Here is the trailer for the upcoming film ‘TIL DEATH DO US PART. 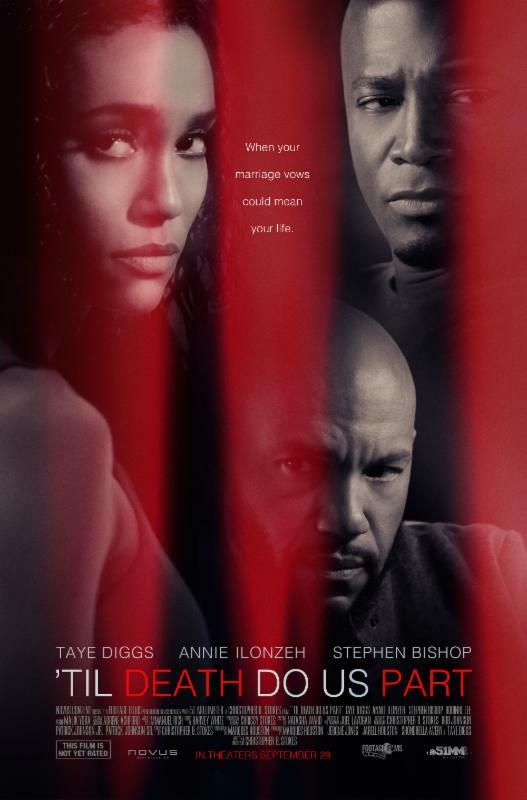 The film is directed by Christopher B. Stokes, starring Taye Diggs (“Empire”), Annie Ilonzeh (All Eyez On Me, “Empire”), Stephen Bishop (“Imposters”), Malik Yoba (“Designated Survivor”) and Robinne Lee (50 Shades Darker) . Eva (Julia Louis-Dreyfus) is a divorced soon-to-be empty-nester wondering about her next act. Then she meets Marianne (Catherine Keener), the embodiment of her perfect self. Armed with a restored outlook on being middle-aged and single, Eva decides to take a chance on her new love interest Albert (James Gandolfini) – a sweet, funny and like-minded man. Things get complicated when Eva discovers that Albert is in fact the dreaded ex–husband of Marianne. This sharp insightful comedy follows Eva as she humorously tries to secretly juggle both relationships and wonders whether her new favorite friend’s disastrous ex can be her cue for happiness. Determined to get engaged before her youngest sister’s wedding, flight attendant Montana Moore (Paula Patton) finds herself with only 30 days to find Mr. Right. Using her airline connections to “accidentally” meet up with eligible ex-boyfriends and scour for potential candidates, she racks up more than 30,000 miles and countless comedic encounters, all the while searching for the perfect guy. Cast: Chiwetel Ejiofor, Michael Fassbender, Benedict Cumberbatch, Paul Dano, Garret Dillahunt, Paul Giamatti, Scoot McNairy, Lupita Nyong’o, Adepero Oduye, Sarah Paulson, Brad Pitt, Michael Kenneth Williams, Alfre Woodard, Chris Chalk, Taran Killam, Bill Camp. 12 YEARS A SLAVE is based on an incredible true story of one man’s fight for survival and freedom. In the pre-Civil War United States, Solomon Northup (Chiwetel Ejiofor), a free black man from upstate New York, is abducted and sold into slavery. Facing cruelty (personified by a malevolent slave owner, portrayed by Michael Fassbender) as well as unexpected kindnesses, Solomon struggles not only to stay alive, but to retain his dignity. In the twelfth year of his unforgettable odyssey, Solomon’s chance meeting with a Canadian abolitionist (Brad Pitt) forever alters his life. In a contemporary adaptation of Langston Hughes’ celebrated play, the holiday musical drama BLACK NATIVITY follows Langston (Jacob Latimore), a street-wise teen from Baltimore raised by a single mother, as he journeys to New York City to spend the Christmas holiday with his estranged relatives Reverend Cornell and Aretha Cobbs (Forest Whitaker and Angela Bassett). Unwilling to live by the imposing Reverend Cobbs’ rules, a frustrated Langston is determined to return home to his mother, Naima (Jennifer Hudson). Langston embarks on a surprising and inspirational journey and along with new friends, and a little divine intervention, he discovers the true meaning of faith, healing, and family. Here is the trailer from Fox Searchlight’s upcoming film “Baggage Claim”, opening in theaters everywhere on September 27, 2013. The film is directed by David E. Talbert starring Paula Patton, Derek Luke, Octavia Spencer, Taye Diggs, Djimon Hounsou, Lauren London, Jill Scott, Adam Brody. Here is the new trailer from Fox Searchlight’s upcoming film BAGGAGE CLAIM . The movie is directed by David E. Talbert, starring Paula Patton, Derek Luke, Octavia Spencer, Taye Diggs, Djimon Hounsou, Lauren London, Jill Scott, Adam Brody. BAGGAGE CLAIM will be in theaters September 27, 2013. Here is the teaser trailer from the upcoming film “BETWEEN US”. The movie is directed by Dan Mirvish, starring Julia Stiles, Taye Diggs, Melissa George. BETWEEN US will be screened at the Slamdance Film Festival on Sunday, Jan. 20th at 5:40pm in Park City, Utah. Grace (Julia Stiles) and Carlo (Taye Diggs) are a newly married New York couple who visit old friends Sharyl (Melissa George) and Joel (David Harbour) in their huge Midwestern home. But despite their wealth, the hosts are in a violently destructive marriage on the verge of falling apart. Two years later, the couples reunite in New York, but now the tables are turned as the young couple struggles with their marriage, children and financial woes, only to discover that their old friends are even more successful and much happier than they were before. Here is the new official trailer and poster from Omni/FSR upcoming film, Dylan Dog: Dead of Night. The movie is directed by Kevin Munroe, starring Brandon Routh, Sam Huntington, Anita Briem, Peter Stormare, Taye Diggs. 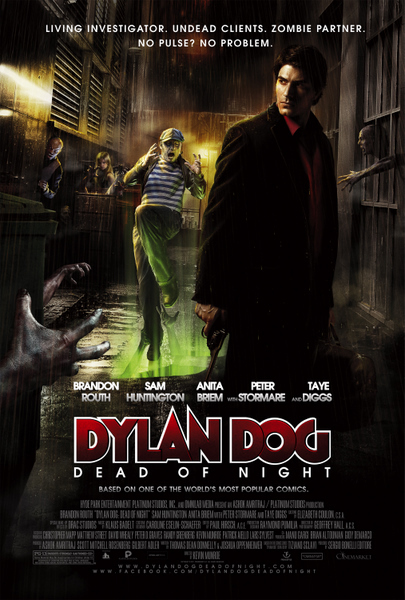 DYLAN DOG: DEAD OF NIGHT – in select theaters on April 29, 2011!